Ferm Living discovered Chinese designer, Mario Tsai, at the 2017 Stockholm Furniture Fair. An immediate admiration for his design struck up a conversation which ultimately led to a collaboration with Ferm Living, which they describe as a ‘ season highlight’ - The Insert Side Table. Mario’s refined design ethos incorporates geometry to explore new shapes & to find natural fits for his furniture. The refined design is a perfect union of function & aesthetic, with emphasis on multi-functionality in his furniture. Below is an interview by Ferm living with Mario about his design process & his journey to becoming a designer. Mario Tsai had never travelled to the Nordic countries before he went to Stockholm Furniture Fair as a participant in the Greenhouse for young design talents. “I really like the Nordic design, and I was longing to go there,” Mario remembers. “I think it’s great how Nordic brands like to collaborate with young designers from all over the world. It truly is a great opportunity for aspiring talents. So, when I got accepted to the Greenhouse, it was a fantastic chance for me. It definitely marked the beginning of my design studio,” he says. Influenced by the Nordic design tradition, Mario Tsai sees himself as part of a minimalist design scene. But naturally with his own take on what minimalism should look and feel like. He has sometimes referred to his approach as ‘soft minimalism’, so of course, we had to know what he means by this. “Minimalism as the beginning of modern design makes our lives simple and beautiful, but sometimes it gets so cold and ruthless in emotions, so I try to make my minimalism softer and warmer. I try different ways to make the designs soft in their minimalism – for example by integrating mild materials or matching warmer colours,” Mario explains. It is clear to all that to Mario Tsai, good design finds its foundation in beauty and intuition – his design language is easy, light, and focuses on usability. 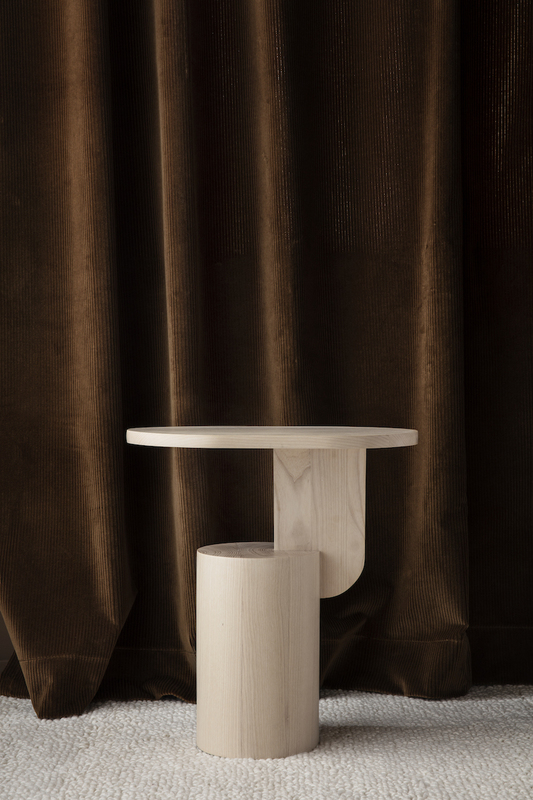 The Insert Side Table is available now at Maven.